Good evening! The heavy rain that we saw yesterday and overnight has moved out of the area. Light showers have stuck around all day and will continue tonight. Otherwise, if you aren’t seeing any rainfall, expect overcast and misty conditions. Some areas in the extreme northern portions of McCurtain Co. and SW Arkansas may see a few flurries mixed in with rain overnight. No accumulation is expected. Lows tonight will be in the low to mid 30s. This will be a chilly start to your Sunday. Feels-like temperatures could be in the upper 20s, low 30s. Make sure to bundle up! Looks like we dry out tomorrow, but the cloudy conditions stick around with us. Highs in the mid 40s. Low 50s for Monday with lots of sunshine. A mix of sun and clouds for Tuesday with highs in the mid 50s. Keep in mind, average high for this time of year is 60°, so we will continue to stay below average. Our next weather system looks to approach towards the middle of the week. A cold front will be in areas of Oklahoma and Texas, just west of the ArkLaTex Wednesday. This will promote cloud cover throughout most of the day. Shower chances will increase in the afternoon and evening hours. Highs in the upper 50s. Rain chances increase for Thursday. Scattered showers possible throughout the day that would make it a very wet day. Highs will be in the low 60s, so not as cold as what we saw this weekend. Winds could be quite gusty as this system moves through. Some showers will linger into Friday morning, otherwise cloudy skies. highs on Friday, cooler, in the low 50s. Looks like right now, high pressure will build in for the start of next weekend. 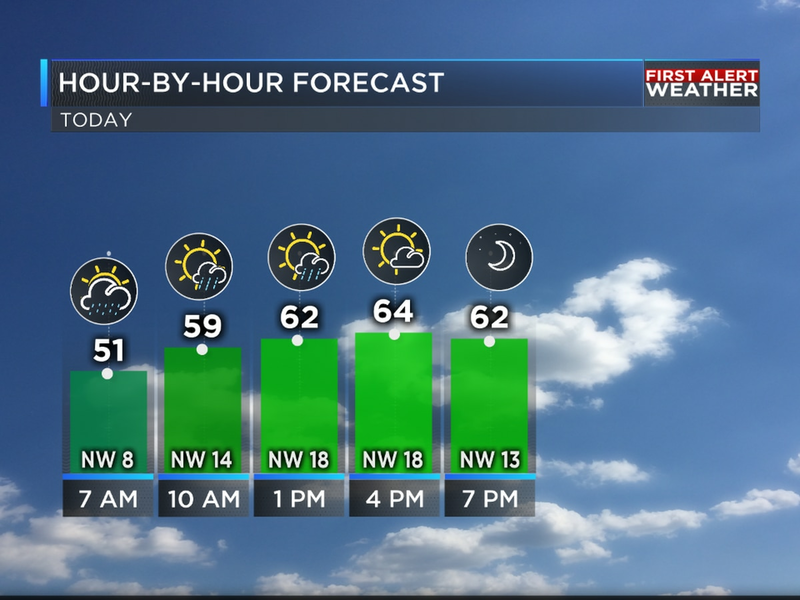 Highs in the upper 50s with partly cloudy skies.